Seamlessly transition your team communication to Kibela! We currently support the following services. We plan to expand to support more services in the future, but feel free to contact us via the chat located at the bottom right if you have a particular service you’d like to see supported. When importing articles, Kibela will first check if the same author exists in Kibela by comparing the username. If so, the imported articles will be associated with that user. If this behavior is against your intention, change the username in either service. If not, a temporary user will be created. This temporary user will not be charged. What happens if I import content to Kibela multiple times? Articles already imported to Kibela will not be duplicated, and only new content not on Kibela will be imported. 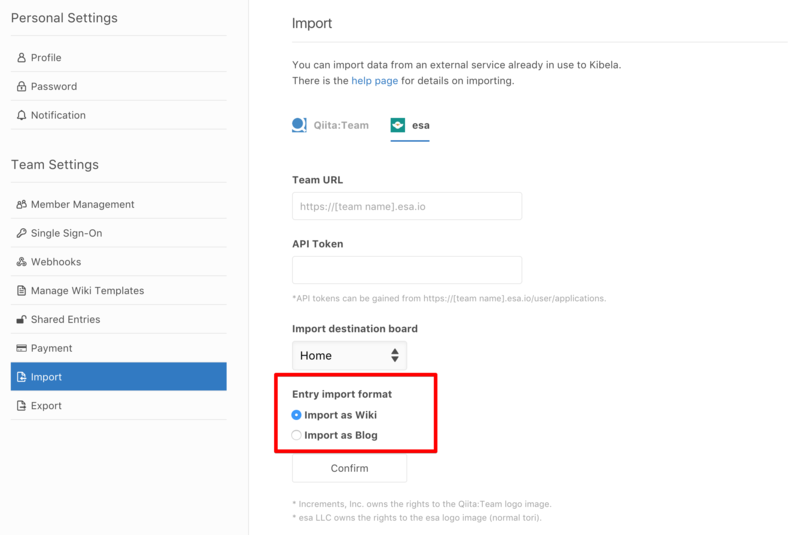 How long does it take to import articles to Kibela? It depends on the volume. If you import a lot of data, it may take a while. But don't worry, you'll still be able to use Kibela as usual, and the team admin will be notified by email once the data is fully imported. 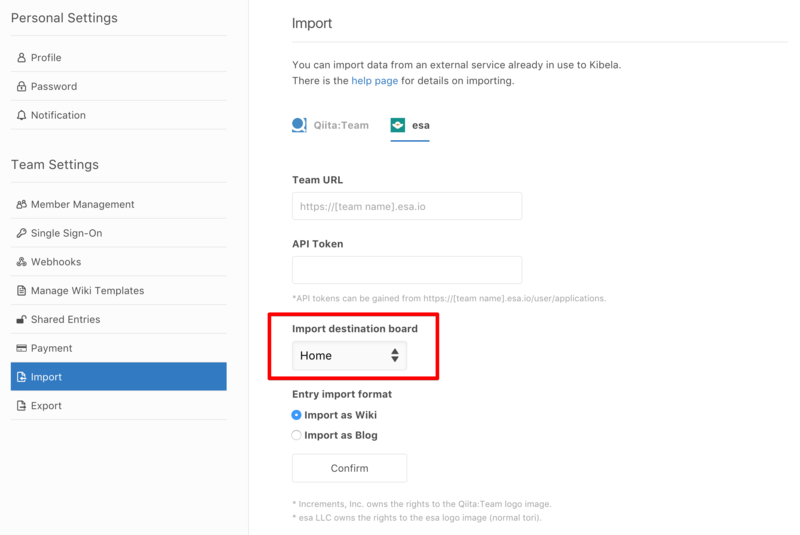 You need an API Token to import your content from Qiita:Team. To begin, follow the procedures listed below for details (in Japanese). Collaborated articles will be imported as wiki articles, and single author articles will be imported as blogs. As of now, we do not import tags. Where will the imported articles be placed? Groups on your Qiita:team account will also be imported to Kibela as separate groups. What will happen to content shared on private groups? Content on private groups will only be imported if you select the option Import content on private groups. 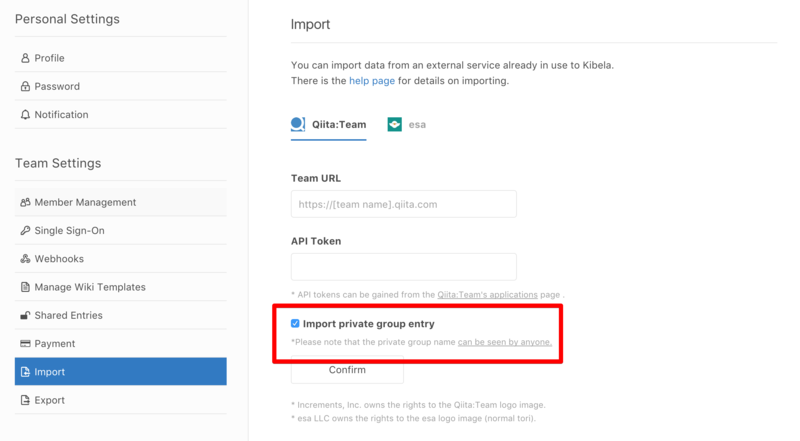 Due to the constraint of the Qiita:Team specification, you can only import contents on private groups the associated API Token user has access to. You need an API token to import your content from Esa. The API token can be obtained from the following link. You are able to choose whether to import your content as blogs or wiki. WIP articles will be imported to Kibela with [WIP] in the title. You can choose which group you prefer to import your content. Once selected, all content will be imported to the selected group.